An X-ray picture (radiograph), taken by Wilhelm Röntgen in 1896, of Albert von Kölliker's hand. X-rays (or Röntgen rays) are a form of electromagnetic radiation with a wavelength in the range of 10 to 0.01 nanometers, corresponding to frequencies in the range 30 to 30,000 PHz (1015 hertz). X-rays are a form of ionizing radiation and as such can be dangerous. In many languages it is called Röntgen radiation after one of the investigators of the radiation, Wilhelm Röntgen. X-rays are valuable in the field of medicine and for scientific research. In medicine, they are primarily used for diagnostic radiography. In science, they are used for the determination of crystal structures by the technique known as X-ray crystallography. In addition, X-ray telescopes are important for astronomical observations. As technology develops at a steady pace, many other applications of X-rays may emerge as well. Among the important early researchers in X-rays were Professor Ivan Pului, Sir William Crookes, Johann Wilhelm Hittorf, Eugen Goldstein, Heinrich Hertz, Philipp Lenard, Hermann von Helmholtz, Nikola Tesla, Thomas Edison, Charles Glover Barkla, Max von Laue, and Wilhelm Conrad Röntgen. Physicist Johann Hittorf (1824-1914) observed tubes with energy rays extending from a negative electrode. These rays produced a fluorescence when they hit the glass walls of the tubes. In 1876 the effect was named "cathode rays" by Eugen Goldstein, and today are known to be streams of electrons. Later, English physicist William Crookes investigated the effects of electric currents in gases at low pressure, and constructed what is called the Crookes tube. It is a glass vacuum cylinder, containing electrodes for discharges of a high voltage electric current. He found, when he placed unexposed photographic plates near the tube, that some of them were flawed by shadows, though he did not investigate this effect. In April 1887, Nikola Tesla began to investigate X-rays using high voltages and vacuum tubes of his own design, as well as Crookes tubes. From his technical publications, it is indicated that he invented and developed a special single-electrode X-ray tube, which differed from other X-ray tubes in having no target electrode. He stated these facts in his 1897 X-ray lecture before the New York Academy of Sciences. The principle behind Tesla's device is nowadays called the Bremsstrahlung process, in which a high-energy secondary X-ray emission is produced when charged particles (such as electrons) pass through matter. By 1892, Tesla performed several such experiments, but he did not categorize the emissions as what were later called X-rays, instead generalizing the phenomenon as radiant energy. He did not publicly declare his findings nor did he make them widely known. His subsequent X-ray experimentation by vacuum high field emissions led him to alert the scientific community to the biological hazards associated with X-ray exposure. In 1892, Heinrich Hertz began experimenting and demonstrated that cathode rays could penetrate very thin metal foil (such as aluminum). Philipp Lenard, a student of Heinrich Hertz, further researched this effect. He developed a version of the cathode tube and studied the penetration by X-rays of various materials. Philipp Lenard, though, did not realize that he was producing X-rays. Hermann von Helmholtz formulated mathematical equations for X-rays. He postulated a dispersion theory before Röntgen made his discovery and announcement. It was formed on the basis of the electromagnetic theory of light (Wiedmann's Annalen, Vol. XLVIII). However, he did not work with actual X-rays. On November 8, 1895, Wilhelm Conrad Röntgen, a German scientist, began observing and further documenting X-rays while experimenting with vacuum tubes. Röntgen, on December 28, 1895, wrote a preliminary report "On a new kind of ray: A preliminary communication." He submitted it to the Würzburg's Physical-Medical Society journal. This was the first formal and public recognition of the categorization of X-rays. Röntgen referred to the radiation as "X," to indicate that it was an unknown type of radiation. The name stuck, although (over Röntgen's great objections), many of his colleagues suggested calling them Röntgen rays. They are still referred to as such in many languages. Röntgen received the first Nobel Prize in Physics for his discovery. Röntgen was working on a primitive cathode ray generator that was projected through a glass vacuum tube. Suddenly he noticed a faint green light against the wall. The odd thing he had noticed, was that the light from the cathode ray generator was traveling through a bunch of the materials in its way (paper, wood, and books). He then started to put various objects in front of the generator, and as he was doing this, he noticed that the outline of the bones from his hand were displayed on the wall. Röntgen said he did not know what to think and kept experimenting. Two months after his initial discovery, he published his paper translated "On a New Kind of Radiation" and gave a demonstration in 1896. 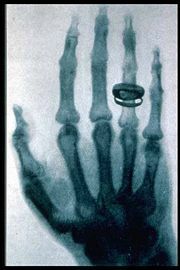 Rontgen discovered its medical use when he saw picture of his wife's hand on a photographic plate formed due to X-Rays. His wife's hand's photograph was the first ever photograph of a human body part using the X-Rays. In 1906, physicist Charles Barkla discovered that X-rays could be scattered by gases, and that each element had a characteristic X-ray. He won the 1917 Nobel Prize in Physics for this discovery. In 1912, Max von Laue, Paul Knipping and Walter Friedrich observed for the first time the diffraction of X-rays by crystals. This discovery, along with the early works of Paul Peter Ewald, William Henry Bragg, and William Lawrence Bragg gave birth to the field of X-ray crystallography. The use of X-rays for medical purposes (to develop into the field of radiation therapy) was pioneered by Major John Hall-Edwards in Birmingham, England. In 1908, he had to have his left arm amputated owing to the spread of X-ray dermatitis. In the 1950s, X-rays were used to produce an X-ray microscope. In the 1980s, an X-ray laser device was proposed as part of the Reagan administration's Strategic Defense Initiative, but the first and only test of the device (a sort of laser "blaster," or death ray, powered by a thermonuclear explosion) gave inconclusive results. For technical and political reasons, the overall project (including the X-ray laser) was de-funded (though was later revived by the second Bush administration as National Missile Defense using different technologies). In the 1990s, the Chandra X-ray Observatory was launched, allowing the exploration of the very violent processes in the universe which produce X-rays. Unlike visible light, which is a relatively stable view of the universe, the X-ray universe is unstable, it features stars being torn apart by black holes, galactic collisions, and novas, neutron stars that build up layers of plasma that then explode into space. X-rays are a type of electromagnetic radiation with wavelengths of around 10-10 meters. When medical X-rays are being produced, a thin metallic sheet is placed between the emitter and the target, effectively filtering out the lower energy (soft) X-rays. This is often placed close to the window of the X-ray tube. The resultant X-ray is said to be hard. Soft X-rays overlap the range of extreme ultraviolet. The frequency of hard X-rays is higher than that of soft X-rays, and the wavelength is shorter. Hard X-rays overlap the range of "long"-wavelength (lower energy) gamma rays, however the distinction between the two terms depends on the source of the radiation, not its wavelength; X-ray photons are generated by energetic electron processes, gamma rays by transitions within atomic nuclei. in David R. Lide: CRC Handbook of Chemistry and Physics 75th edition. CRC Press, 10-227. ISBN 0-8493-0475-X. The basic production of X-rays is by accelerating electrons in order to collide with a metal target (usually tungsten or a more crack resistant alloy of rhenium (5 percent) and tungsten (95 percent), but sometimes molybdenum for more specialized applications). Molybdenum targets are often used when soft X-rays are needed as in mammography. Here the electrons suddenly decelerate upon colliding with the metal target and if enough energy is contained within the electron it is able to knock out an electron from the inner shell of the metal atom and as a result electrons from higher energy levels then fill up the vacancy and X-ray photons are emitted. This process is extremely inefficient and requires a way of removing the heat generated. This causes the spectral line part of the wavelength distribution. There is also a continuum bremsstrahlung component given off by the electrons as they are scattered by the strong electric field near the high Z (proton number) nuclei. Nowadays, for many (non medical) applications, X-ray production is achieved by synchrotrons (see synchrotron light). The X-ray photographic plate or film is used in hospitals to produce images of the internal organs and bones of a patient. Since photographic plates are not generally sensitive to X-rays, phosphorescent screens are usually placed in contact with the emulsion of the plate or film. The X-rays strike the phosphor screen, which emits visible light, which exposes the film. The emulsion still needs to be heavily doped with silver compounds and can be coated on both sides of the film or plate. The part of the patient to be X-rayed is placed between the X-ray source and the photographic receptor to produce what is a shadow of all the internal structure of that particular part of the body being X-rayed. The X-rays are blocked by dense tissues such as bone and pass through soft tissues. Those areas where the X-rays strike the photographic receptor turn black when it is developed. So where the X-rays pass through "soft" parts of the body such as organs, muscle, and skin, the plate or film turns black. Contrast compounds containing barium or iodine, which are radiopaque, can be injected in the artery of a particular organ, or given intravenously. The contrast compounds essentially block the X-rays and hence the circulation of the organ can be more readily seen. Many years ago thorium was used as a contrast medium (Thorotrast)—this caused many people to be injured or even die from the effects of the radiation from the thorium. An increasingly common method of detecting X-rays is the use of Photostimulable Luminescence (PSL), pioneered by Fuji in the 1980s. In modern hospitals a PSP plate is used in place of the photographic plate. After the plate is X-rayed, excited electrons in the phosphor material remain 'trapped' in 'colour centres' in the crystal lattice until stimulated by a laser beam passed over the plate surface. The light given off during laser stimulation is collected by a photomultiplier tube and the resulting signal is converted into a digital image by computer technology, which gives this process its common name, computed radiography. The PSP plate can be used over and over again. Initially, most common detection methods were based on the ionisation of gases, as in the Geiger-Müller counter: a sealed volume, usually a cylinder, with a polymer or thin metal window contains a gas, and a wire, and a high voltage is applied between the cylinder (cathode) and the wire (anode). When an X-ray photon enters the cylinder, it ionizes the gas. These ions accelerate toward the anode, in the process causing further ionisation along their trajectory. This process, known as an avalanche, is detected as a sudden flow of current, called a "count" or "event." For many applications, counters are not sealed but are constantly fed with purified gas (thus reducing problems of contamination or gas aging). These are called "flow counter." Some materials such as sodium iodide (NaI) can "convert" an X-ray photon to a visible photon; an electronic detector can be built by adding a photomultiplier. These detectors are called "scintillators," filmscreens or "scintillation counters." The main advantage of using these is that an adequate image can be obtained while subjecting the patient to a much lower dose of X-rays. Since the 1970s, new semiconductor detectors have been developed (silicon or germanium doped with lithium, Si(Li) or Ge(Li)). X-ray photons are converted to electron-hole pairs in the semiconductor and are collected to detect the X-rays. When the temperature is low enough (the detector is cooled by Peltier effect or best by liquid nitrogen), it is possible to directly determine the X-ray energy spectrum; this method is called energy dispersive X-ray spectroscopy (EDX or EDS); it is often used in small X-ray fluorescence spectrometers. These detectors are sometimes called "solid detectors." Cadmium telluride (CdTe) and its alloy with zinc, cadmium zinc telluride detectors have an increased sensitivity, which allows lower doses of X-rays to be used. Practical application in Medical Imaging didn't start taking place until the 1990s. Currently amorphous selenium is used in commercial large area flat panel x-ray detectors for chest radiography and mammography. Silicon drift detectors (SDDs), produced by conventional semiconductor fabrication, now provide a cost-effective and high resolving radiation measurement. They replace conventional X-ray detectors, such as Si(Li)s, as they do not need to be cooled with liquid nitrogen. With the advent of large semiconductor array detectors it has become possible to design detector systems using a scintillator screen to convert from X-rays to visible light which is then converted to electrical signals in an array detector. Indirect Flat Panel Detectors (FPDs) are in widespread use today in medical, dental, veterinary, and industrial applications. A common form of these detectors is based on amorphous silicon TFT/photodiode arrays. The array technology is a variant on the amorphous silicon TFT arrays used in many flat panel displays, like the ones in computer laptops. The array consists of a sheet of glass covered with a thin layer of silicon that is in an amorphous or disordered state. At a microscopic scale, the silicon has been imprinted with millions of transistors arranged in a highly ordered array, like the grid on a sheet of graph paper. Each of these thin film transistors (TFT’s) are attached to a light-absorbing photodiode making up an individual pixel (picture element). Photons striking the photodiode are converted into two carriers of electrical charge, called electron-hole pairs. Since the number of charge carriers produced will vary with the intensity of incoming light photons, an electrical pattern is created that can be swiftly converted to a voltage and then a digital signal, which is interpreted by a computer to produce a digital image. Although silicon has outstanding electronic properties, it is not a particularly good absorber of X-ray photons. For this reason, X-rays first impinge upon scintillators made from either gadolinium oxysulfide or cesium iodide. The scintillator absorbs the X-rays and converts them into visible light photons that then pass onto the photodiode array. While generally considered invisible to the human eye, in special circumstances X-rays can be visible. Brandes, in an experiment a short time after Röntgen's landmark 1895 paper, reported after dark adaptation and placing his eye close to an X-ray tube, seeing a faint "blue-gray" glow that seemed to originate within the eye itself. Upon hearing this, Röntgen reviewed his record books and found he too had seen the effect. When placing an X-ray tube on the opposite side of a wooden door Röntgen had noted the same blue glow, seeming to emanate from the eye itself, but thought his observations to be spurious because he only saw the effect when he used one type of tube. Later he realized that the tube which had created the effect was the only one powerful enough to make the glow plainly visible and the experiment was thereafter readily repeatable. The knowledge that X-rays are actually faintly visible to the dark-adapted naked eye has largely been forgotten today; this is probably due to the desire not to repeat what would now be seen as a recklessly dangerous and harmful experiment with ionizing radiation. It is not known what exact mechanism in the eye produces the visibility. It could be due to conventional detection (excitation of rhodopsin molecules in the retina); or direct excitation of retinal nerve cells; or secondary detection via, for instance, X-ray induction of phosphorescence in the eyeball with conventional retinal detection of the secondarily produced visible light. 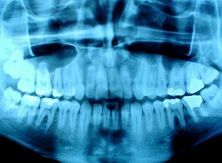 X-rays can reveal the details of bones and teeth. 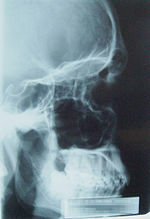 X-Ray Image of a male skull. X-rays are especially useful in the detection of pathology of the skeletal system, but are also useful for detecting some disease processes in soft tissue. 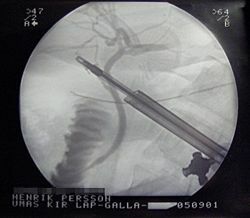 Some notable examples are the very common chest X-ray, which can be used to identify lung diseases such as pneumonia, lung cancer, or pulmonary edema, and the abdominal X-ray, which can detect ileus (blockage of the intestine), free air (from visceral perforations) and free fluid (in ascites). In some cases, the use of X-rays is debatable, such as gallstones (which are rarely radiopaque) or kidney stones (which are often visible, but not always). Also, traditional plain X-rays pose very little use in the imaging of soft tissues such as the brain or muscle. Imaging alternatives for soft tissues are computed axial tomography (CAT or CT scanning), magnetic resonance imaging (MRI) or ultrasound. Since 2005, X-rays are listed as a carcinogen by the U.S. government. The efficiency of X-ray tubes is less than 2 percent. Most of the energy is used to heat up the anode. X-ray crystallography in which the pattern produced by the diffraction of X-rays through the closely spaced lattice of atoms in a crystal is recorded and then analyzed to reveal the nature of that lattice. ↑ Major John Hall-Edwards, Birmingham City Council. Retrieved April 16, 2008. ↑ Silicon drift detectors, KETEK GmbH. Retrieved April 16, 2008. ↑ Tales from the Atomic Age, Thomas W. Frame. Retrieved April 16, 2008. Guinier, A. 1994. X-Ray Diffraction: In Crystals, Imperfect Crystals, and Amorphous Bodies. Mineola, NY: Dover Publications. ISBN 0486680118. Fitzgerald, Frances. 2001. Way Out There in the Blue: Reagan, Star Wars and the End of the Cold War. New York, NY: Simon & Schuster. ISBN 0743200233. Rothenberg, Mikel A. 1998. Understanding X-Rays: A Plain English Approach. Eau Claire, WI: PESI HealthCare. ISBN 1559579994. Sample, Sharron. The Electromagnetic Spectrum: X-rays. NASA. Retrieved October 14, 2007. Design of an x-ray tube (Animation) – BIGS. This page was last modified on 1 August 2013, at 14:36.